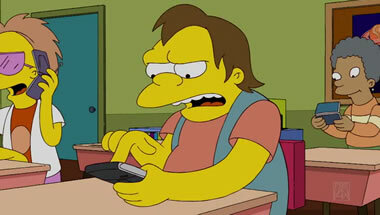 The Sunday, October 4th episode of The Simpsons cartoon pokes fun at technology in schools. The show opens with Bart Simpson's teacher, Edna Krabappel, grading papers as she gets out of bed. The episode cuts to Edna standing in front of a classroom full of students playing games, watching videos, texting, and talking on their mobile phones. It is chaotic. She struggles to gain the class' attention. Many mobile phones have apps you can download for practicing multiplication problems. Perhaps redirecting students to those apps could grab their attention and be self-grading. Then she could walk around with a clipboard noting each student's progress. Admittedly, dealing with several different kinds of mobile phone platforms would be annoying since they all work differently and have different sets of applications available. Ms. Krabappel asks, "You're children! Why do you all need cell phones?" They yell out "Safety," "Emergency," and "Educational." These reasons are shouted out as an automatic response to the teacher's question, all the while students continue their talking, texting, and gaming. The reasons to bring phones to class don't matter to the students. As long as they get to have their toys, they are are happy. Edna then sighs and says, "Could you at least set them to vibrate?" Once on vibrate, the phones make even more noise. The teacher gets fed up and collects all of the phones from her students. She proclaims, "No more gizmos in this class." The students are very disappointed. There seems to be no happy medium when it comes to mobile phone use. The free-for-all didn't work. Simply putting the phones on vibrate didn't work. So banning, not classroom management or curriculum integration, is Edna's answer. 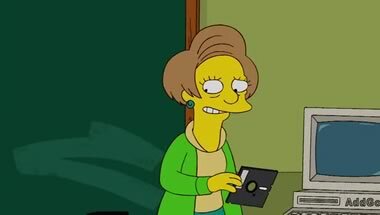 "Hey, don't worry, we still have the good old classroom computer," Edna explains as she walks over to a very outdated machine and inserts a floppy diskette. The game that appears on the screen is very simple and outdated, especially compared to the interactive and complex games the students were playing on their phones. The students' phones (a.k.a. handheld computers) are each far more powerful and interactive than the classroom computer. It's a shame that potential learning tools are locked in a drawer. Because of unrelated events, Ms. Krabappel is replaced. Her replacement invites phones, texting, Facebook, blogging, Twitter, and other "cool" stuff into the classroom. Of course, the students are thrilled with his paperless classroom. The students are shown to be excited about what they are doing in class, but are they actually learning anything aside from the technology itself? One of the "cool" things the new teacher does is emails his students a video where he wears jerseys with numbers that are multiples of seven. The jersey video reminds me of Mrs. Burk, the rapping math teacher. The new teacher may be on to something. Lots of teachers are making videos and podcasting. Students seem to respond better to videos that feature people they know. During class, the new teacher asks, "Who can tell me what the Monroe Doctrine was?" One student recites, "The policy of President Monroe that America has a right as a nation to..." The teacher interrupts the student and asks, "Are you telling me that you memorized that fact when anyone with a cell phone can find it out in 30 seconds?" The student realizes, "I've crammed my head full of garbage!" Again, there seems to be no happy medium. It's either lots of memorization of facts vs. only search for facts. Yes, students need to know how to find information. And yes, there are things that students shouldn't have to research because they remember them. 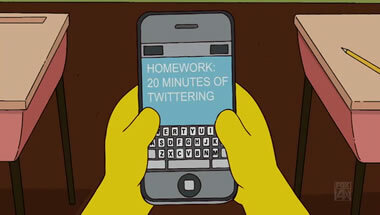 In the end, The Simpsons' parody of mobile phones in schools probably changes the minds of no one. Those that are absolutely opposed to inviting student-owned phones will see the craziness of the first classroom scene as what would really happen in the classroom full of phones--a huge distraction with no learning. Those who want to give students access to any and all technology in classrooms will witness the excited reactions of Bart Simpson's classmates as evidence that using today's technologies are a very good thing--learning should be chaotic. The happy medium that I prefer is using school-owned devices. A class set of iPod touches checked out to students for the school year can be more easily managed. Each student would have access to the same hardware and apps. The teacher can control what apps are installed and what features are enabled. Of course, it's costly to outfit a class of students with handhelds. I do continue to be interested in the idea of students bringing their own devices to class. It would be less costly and demonstrate to students that any device can be used for learning. But it has to be done in the right way with the right philosophy behind it. What are your thoughts about mobile phones in schools? Please comment. If you enjoy The Simpsons brand of humor, you'll get a kick out of other gags in the show. 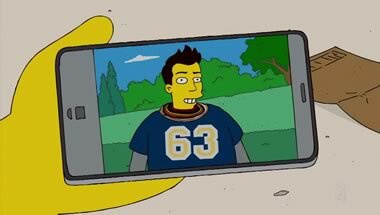 Those in the U.S. can watch the entire episode, "Bart Gets a Z," on Hulu.